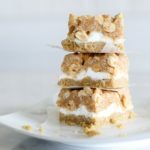 Chewy marshmallows on top of a buttery crust and topped with a crunchy salted peanut topping making these salted peanut chews the best dessert ever! This winning recipe is the original Pillsbury recipe. 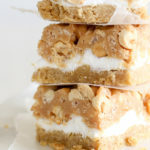 Not every recipe from long ago is the best, but OMG these salted peanut chews are! My mom dug this recipe out and made it for a family event and I was addicted. Like in, could not get enough and ate too much dessert. The next day. And the next day. As soon as I had the chance, I made them to share with you. 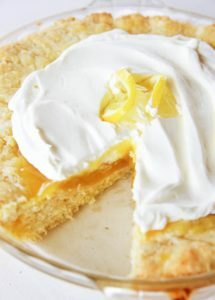 These are packed with flavor and texture which is my favorite kind of easy dessert to make. 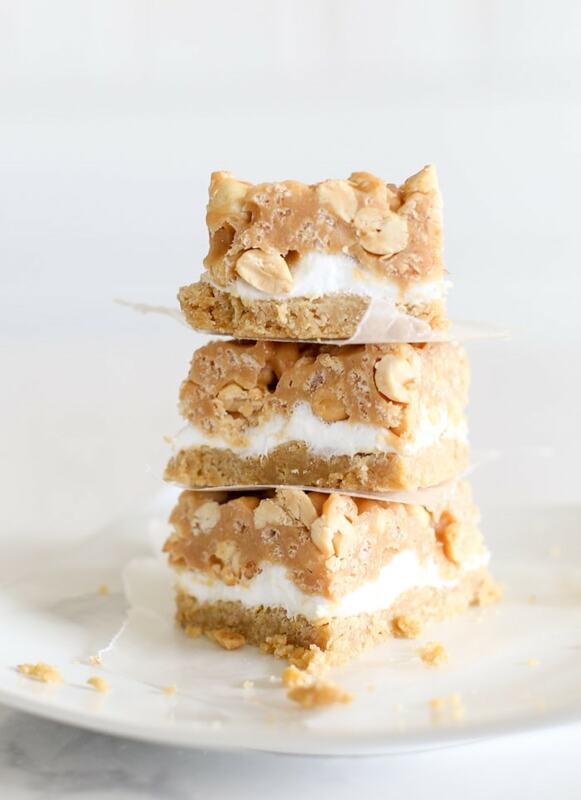 If you like salty and sweet, these have the perfect combination with the buttery crust and the crunchy salty peanuts on top. I’m addicted to these. No lie. They are the very best. In a large bowl combine all the crust ingredients; flour, brown sugar, baking powder, salt, baking soda, butter, vanilla and egg yolks. 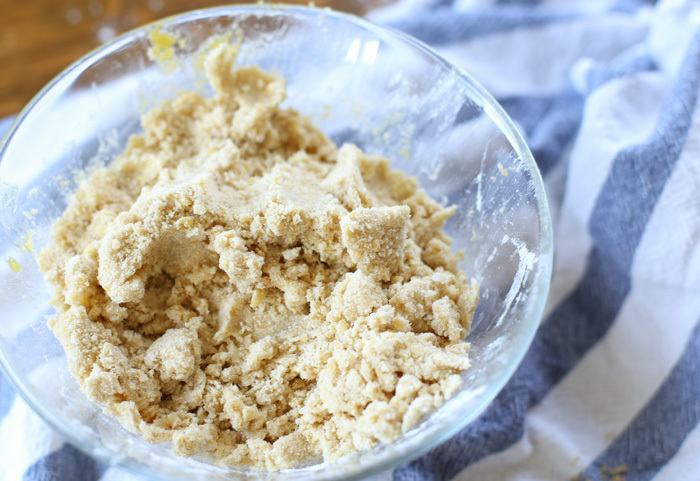 Use a pastry blender to cut in the butter with the remaining ingredients until you have a crumbly mixture. Press the crust into the bottom of an un-greased 13×9 inch pan. Bake at 350° F for 12-15 minutes or until the crust is light golden. 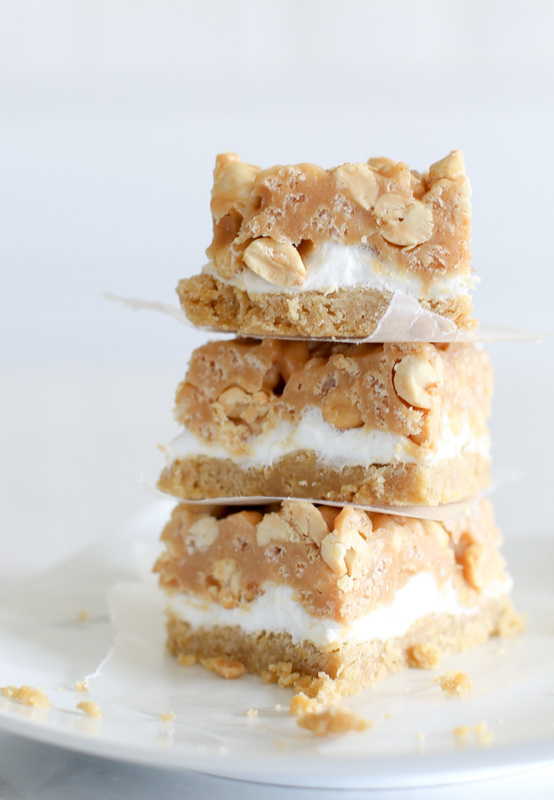 Immediately sprinkle with marshmallows for the second layer of the salted peanut chews. Return to the oven for 1-2 minutes or until the marshmallows begin to puff up. Let cool while you’re preparing the third layer. In a sauce pan combine the corn syrup, butter, vanilla, peanut butter chips on medium heat until the chips are melted and the mixture is smooth. Stir constantly! Remove from the heat and stir in the cereal and nuts. Immediately spoon the warm topping onto the marshmallows! Hurry! As it hardens fast. Let chill before enjoying! If you can wait that long. They are ooey gooey at first and taste just delicious. 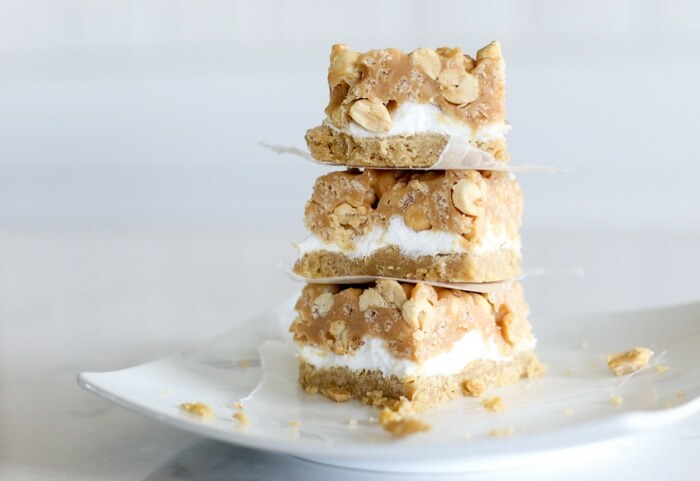 However, you’ll want to chill them to make it easier to cut the salted peanut chews bars. The rich texture is to die for. I mean, serious love coming from me. 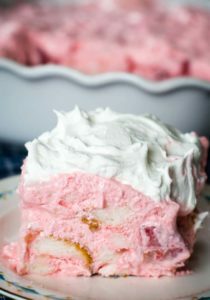 I can’t wait to make these again. 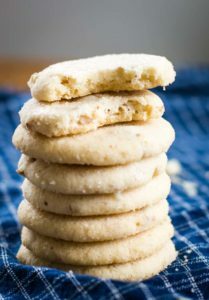 While this recipe is a Pillsbury winner, you’ll find that their recipe for salted peanut chews is somewhat altered from the original. So if you’re looking for the true classic, this recipe is the one! Crumbly butter crust for the first layer. Marshmallows for the second. 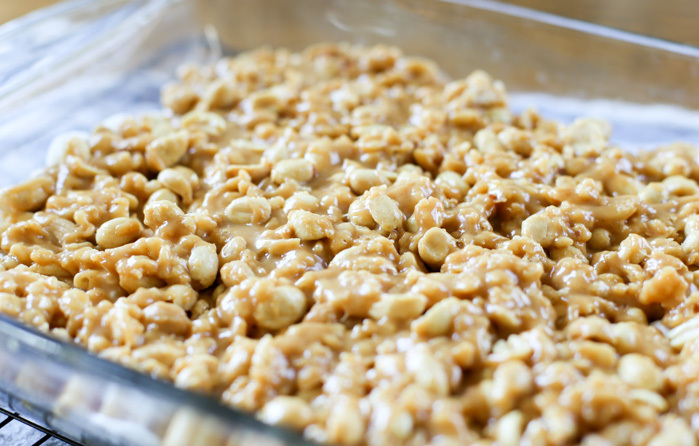 And then topped with a peanut butter crunch sauce. Perfection! Combine all the crust ingredients until crumb mixture forms. Press in the bottom of an un-greased 13×9 inch pan. Bake at 350° F for 12-15 minutes or until light golden brown. Immediately sprinkle with marshmallows. Return to oven 1-2 minutes or until marshmallows begin to puff. Cool while preparing topping. In a large sauce pan heat corn syrup, butter, vanilla and peanut butter chips until chips are melted and the mixture is smooth. Stir constantly! Remove from the heat and stir in the rice cereal and nuts. 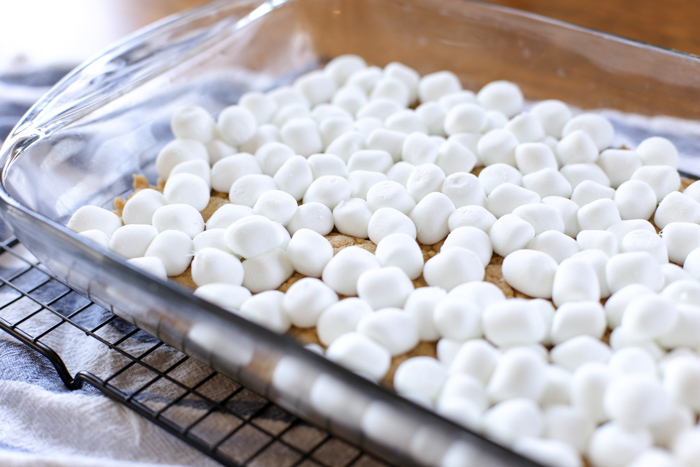 Immediately spoon warm topping over marshmallows. Spread to cover. Let chill and cut into 36 salted peanut chews bars. You’ll want to work fast when you add the warm topping to the marshmallows. It hardens fast. If you can’t find a 12 oz bag of peanut butter chips, an 11 oz bag works just as fine as that’s all I could find. I have been making these ever since I received a Pillsbury bake off winners cookbook in the 80’s and your recipe IS the original — so so good! It’s the one dessert that’s a hit with everyone who tries it. 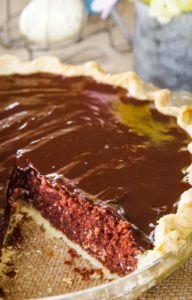 Ive seen other versions with cake mix used for crust that are not nearly as good as this one. Great to see old classics like this being posted for younger bakers!